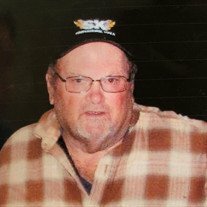 Dennis R. Molebash, 72, rural Culver and formerly of Elkhart, passed at 4:25 p.m., Thursday, Sept. 27, 2018. He was born on June 3, 1946, in Elkhart, to Robert R. and Dorothy E. (Landaw) Molebash. He married on Sept. 15, 1984, in Elkhart, to Sally Wright. He worked for Kampco, Elkhart Machine and Tool, Bennington Boats, Medallion of Culver. He was also self-employed, doing machinist work. He was a 1965 graduate of Jimtown High School. He then received his certification from Elkhart Trade School for Tool and Die. He enjoyed hunting and fishing, woodworking, bowling, drag car racing, snowmobiling, and dirt bike riding. He especially enjoyed coaching his sons’ sporting teams. Survivors include his wife: Sally Molebash, Rochester; sons: Eddie (Kylie) Molebash, Rochester; Robert (Sara) Molebash, Walkerton; grandchildren: Braiden and Aiden; and a brother: Glenn E. Molebash, Elkhart. He was preceded in death by his parents and a brother: Wayne L. Molebash. Services will be held at 10:30 a.m. Monday, Oct. 1, at King Memorial Home, 101 N. Tucker St., Mentone. Burial will take place at Wooden Cemetery at Harrison Center, Etna Green. Visitation is from 2 to 5 p.m. Sunday, Sept. 30, at King Memorial Home. Memorial donations can be made to further youth hunting or your local youth league to assist in children’s lives.